The 2016 Honda CR-V is one of America’s best-selling SUV, and that’s thanks in no small part to its expertly designed interior. Goshen and Monroe families need their crossovers to supply plenty of space while remaining comfortable during even the longest of journeys, and few models are able to deliver quite so superbly as the 2016 CR-V. The CR-V has been expertly designed to ensure that all equipment is exactly where you feel it should be, and there’s an abundance of head, leg, hip, and shoulder room for all occupants thanks to a generous 104.1 cubic feet of passenger volume. 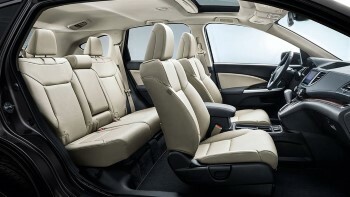 Honda engineers have even made the doors larger for easy entering and exiting, and removed the protruding transmission tunnel that traditionally makes the center-rear seat uncomfortable. The 2016 Honda CR-V is relied upon by families in Goshen, Monroe, and across the United States, and its generous cargo dimensions are a big reason why they place so much stock in it. 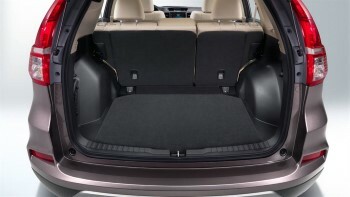 There’s up to 37.2 cubic feet of storage room behind the rear seats, which is more than enough to take anything from the weekly shop to a few large suitcases. Honda has even designed the CR-V with a low-load floor to make it easier to slide in larger items, or even accommodate the family pooch. If you need to take a little extra, just pull on the trunk-mounted levers; spring-loaded, auto-folding rear seatbacks will drop down to create up to 70.9 cubic feet, so you’ll be able to move larger pieces of furniture or drive the kids to college without having to hire a van. The 2016 Honda CR-V takes care of practical requirements, but that doesn’t mean it forgets to offer a host of comfort features to let you enjoy your drive. Heated Front Seats: When the temperature starts to plummet across New York, you can activate the CR-V’s available heated front seats, then keep toasty warm no matter the weather outside. 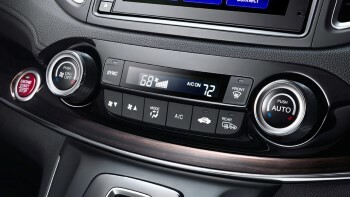 Dual-Zone Climate Control: Both the driver and front-passenger are provided with individual climate controls, so there’s no need to settle for a happy medium instead of selecting two ideal zones. 10-Way Power Driver’s Seat with Power Lumbar Support: With the ability to adjust itself along 10 planes of motion at the touch of a button, and with power lumbar support to soothe your back at the end of a long day, this first-rate feature can feel as though it’s heaven-sent. Now you’ve gotten a picture of the 2016 Honda CR-V interior, it’s time to check it out in person. To do just that around Monroe and Goshen, simply visit Middletown Honda and speak to one of our friendly team members.